My first experience with lettuce wraps – butter lettuce leaves offered with a wide variety of fillings and sauces – was at the Cheesecake Factory, which was an eye-opening foodie moment for me. Instead of soft tortillas, crispy green butter leaves can be used as a lighter alternative to hold raw vegetables (bean sprouts, minced scallions, carrot sticks, chopped tomatoes, diced avocado, thinly sliced cucumber or radishes) and/or cooked vegetables (sautéed mushrooms and/or onions, corn, tofu) blended with herbs (cilantro, mint, basil), and sauce (soy, teriyaki, peanut). The options are vast and only limited by what’s in the garden, pantry, or fridge. The following recipe for Lettuce Wraps was inspired by the Cheesecake Factory and the Purple Carrot whose recipe for Lettuce Cups with Tofu and Thai Basil led me to create an entree that is colorful, flavorful, and full of textures. The flavor of this dish primarily relies on the shallots, garlic, teriyaki sauce, fresh herbs, and lime juice. 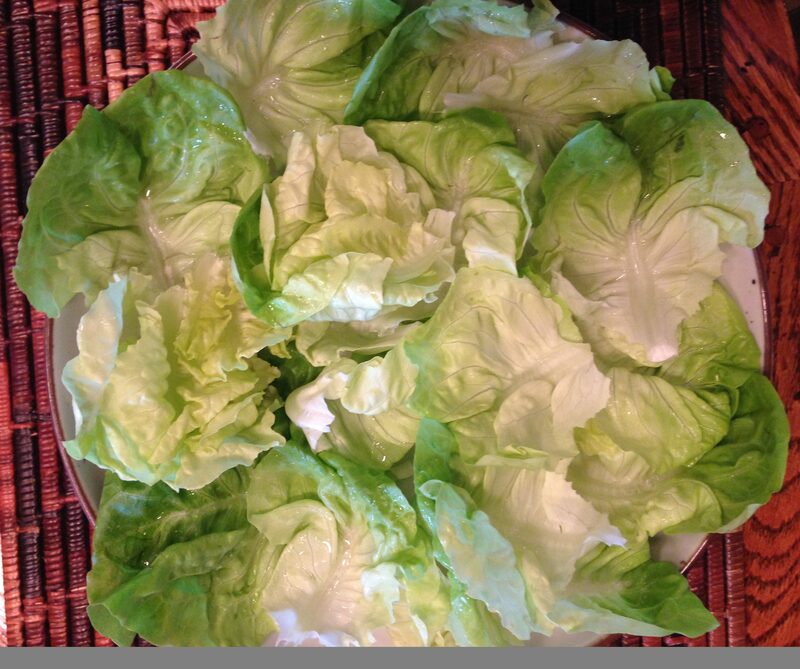 Rinse, dry and cut the butter lettuce leaves off the stem and place on a large serving platter. Drain the tofu block and then cut into small squares by slicing across in one direction and then the other. Place the minced shallots, pressed garlic, and 4 tablespoons of the teriyaki sauce in a large pan and turn the stove on medium-high heat. 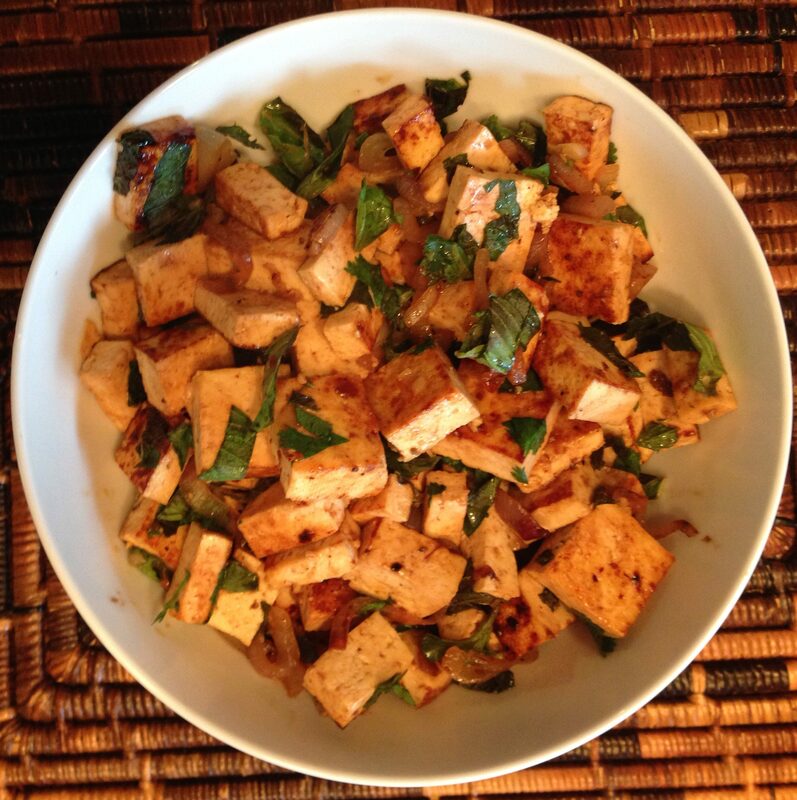 Add the tofu and gently stir to combine the shallots, garlic, sauce, and tofu. Cook for 4-5 minutes and then stir again, turning the heat down to medium if the tofu starts to darken too quickly. Add up to two tablespoons more of teriyaki sauce if the pan starts to dry out. Continue cooking 4-5 more minutes until the tofu is brown. Remove from the heat and set aside. Chop the basil, mint, and cilantro leaves and place in a large mixing bowl. Squeeze the lime juice over the herbs and stir. Add the tofu mixture and stir to blend. Transfer the tofu mixture to a medium-sized serving bowl. 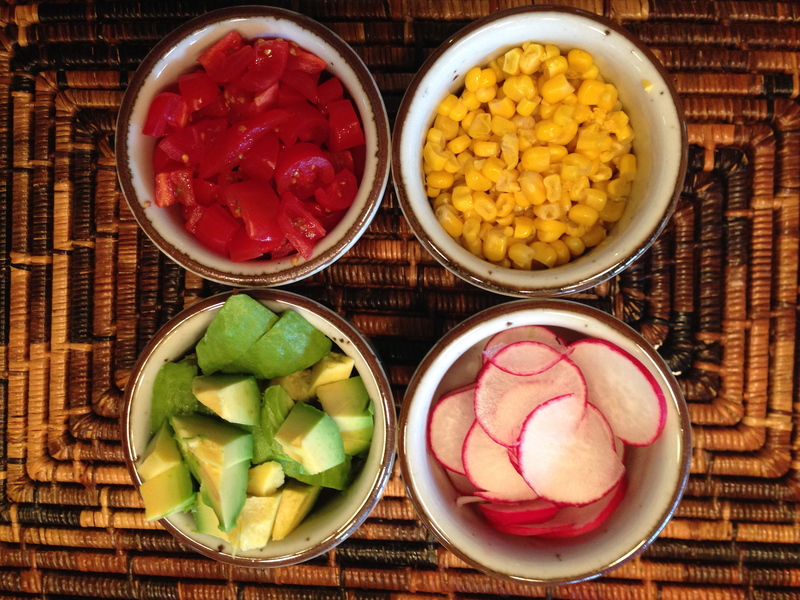 Place the chopped tomatoes, diced avocado, corn, and sliced radishes in separate small serving bowls. 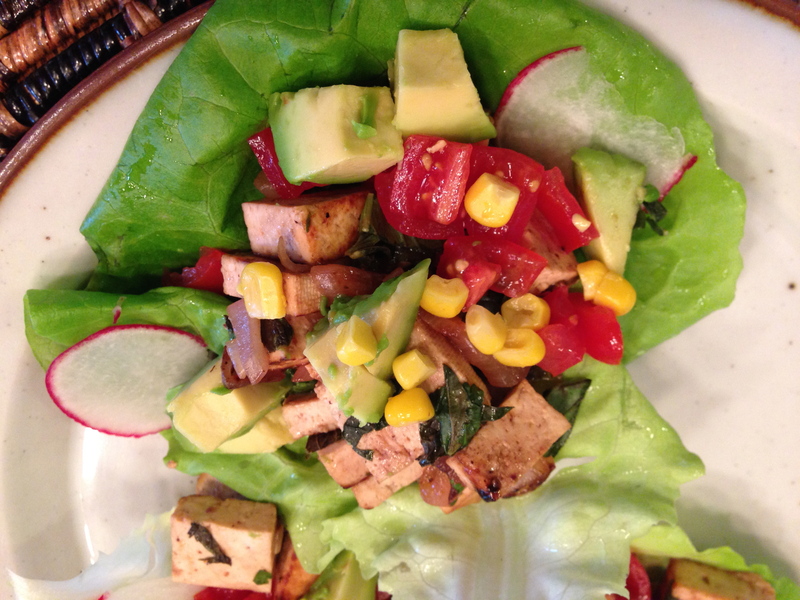 Place the platter of lettuce leaves, the bowl of tofu, and the small bowls of additional fillings (tomatoes, avocado, corn, and radishes) on the table. 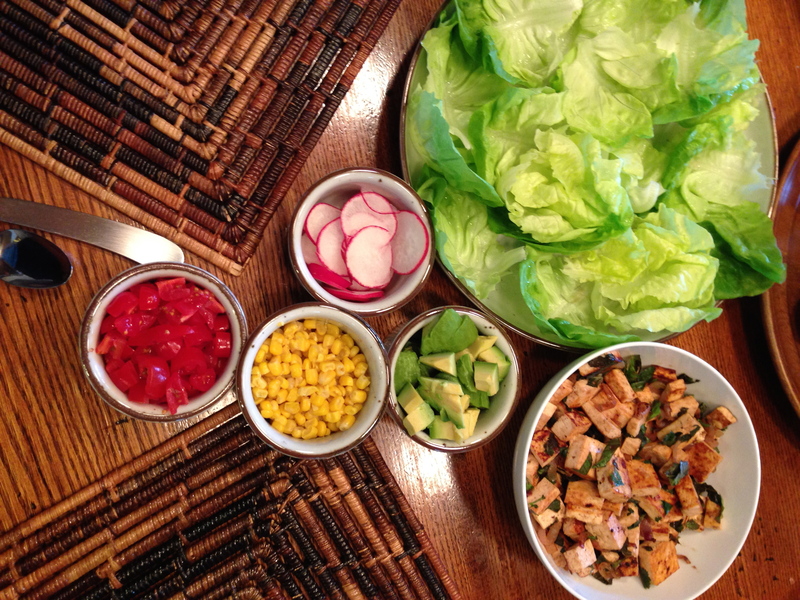 Place 2-3 lettuce leaves on each plate and fill with preferred toppings taking care not to overfill the leaves. Fold each side of the butter lettuce leaf over and enjoy.